Wong is a 70 years old business man, whom I have known for more than 40 years. From a big engineering company many years ago, he has down sized his operation to less than 10 workers. Being a hot tempered man, nobody darns to tell him his wrongs. Over a coffee chat with him, he poured all his anger over his working staffs. Complaining that they are insincere, not working hard, stupid and worked without cooperation among themselves. At the rate he works, I am afraid my friend might fall sick, and if worst off he might even get a stroke for his stressfulness in his face. Directly I told him.... You are a grumpy old man, prideful and stupid yourself. Just imagine, if all your staffs are willing to work independently, intelligence and smart, they would have been a boss to themselves already. Why are they working for you? Because they do not have those qualities as a boss! Being that you are a boss, rightfully you should be motivating them. 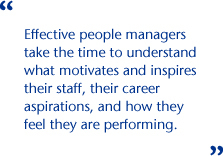 A good manager inspires his workers to work harder, giving encouragement to instil enthusiasm and offering incentives to create excitement. You did nothing, except scolding and more scolding. Three Golden Rules for managing people. Either by threat, incentives or the heart. Wong only knows how to apply the first rule... Threat all the way and he has failed.